The audiophile community is an insular place where science and hard facts can often take a backseat to PR speak that’s treated like religion. Yet some headphones and earbuds rise above the noise and the companies that produce them gain titanous reputations. Noble, a small company operating in the US, with production in Japan, has a reputation for crafting some of the best — and prettiest — headphones you can spend a paycheque on. 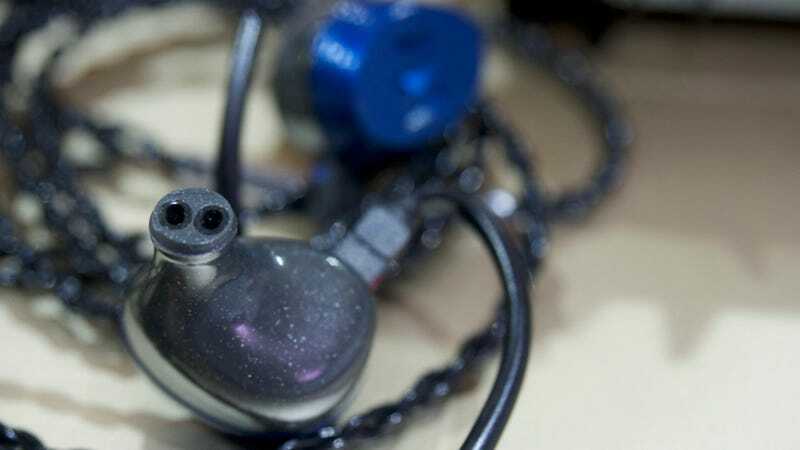 Recently Noble’s redesigned its universal in-ear monitors (high-end earbuds) and now the mid-range Noble Savant IEMs are some of the best fitting buds you can shove in your ear. The very best in-ear monitors require a great seal. Otherwise detail, and bass, is lost. A good seal can be the difference between a £500 set of earbuds sounding like £500 or sounding like the freebies that came with your phone. But when you’re having to wedge an earbud deep down into your ear canal fit can be tricky, particularly because no two sets of ears are the same. I have tiny ear canals. Everyone in my family does. Doctors remark on them as they hold a light up to inspect them, regular earbuds — like the ones included with my iPhone — pop out with the slightest provocation, and when I’m offered my choice of tip sizes for IEMs I inevitably reach for the smallest ones and still often find them wanting. The part you shove in your ear, sans tip. It’s huge! Getting that coveted seal requires constant fiddling with the earbud, opening your mouth just so, winding cords behind your ears and shoving the earbuds back in after each minute slip. But the Noble Savants just fit. They’re a little wider than other earphones, but the extra size works for them rather than against them. I pop the Savants into my ears and forget about them until a flight attendant is asking what I’d like to drink or a coworker is waving their arms in my general direction. Once the conversations are done, the earbuds go back in. They’re a one-handed insertion affair, when many earbuds require two. Noble Savant IEMs are also insanely comfortable. I left them in for the entire duration of a flight — including the 90 minutes hanging out at the airport beforehand — and there was never any fatigue. Trying the same with my Shure 215s or the Fender FXA7s has led to sore ears. 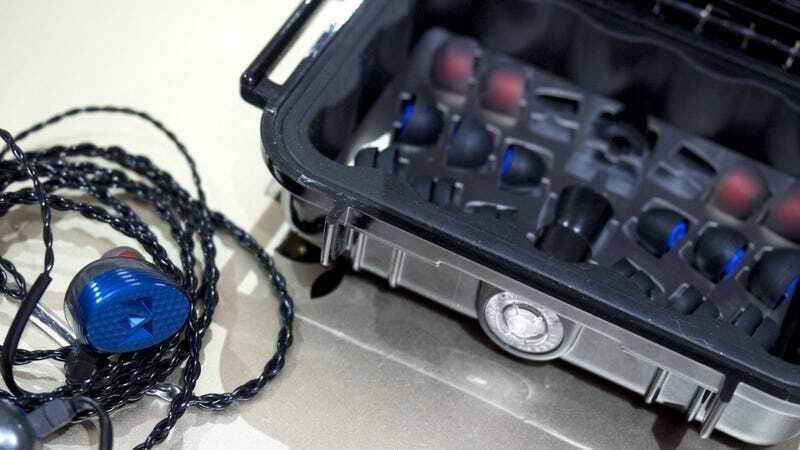 Every set of earbuds in Noble’s Universal line include a fancy Pelican case and wealthy of tips. Unfortunately, as good a fit as the Noble Savant earbuds manage, sound wise they take a distant backseat to the Fender FXA7s. Both IEMs are similarly priced. The Fenders go for £330, while the Savants are £420. The AX7s are also the top of the line IEMs from Fender. The Savants are mid-range Nobles (the most expensive are the well-received £1,150 Noble Kaiser 10Us). The FXA7s just do everything better. I can hear fingers drag across a guitar string between notes, and feel the bass in my chest when I listen to Beyonce’s Lemonade. There’s certainly a grunge factor to the FXA7s. They make all your music sound a little dirty compared to the very clean and bright audio coming out of the Savants. If they both had the same level of detail in the audio, I’d instantly recommend the FXA7s for jazz and rock and the Savants for classical music and movie watching. But the detail in the FXA7s are scores better than the Savants. 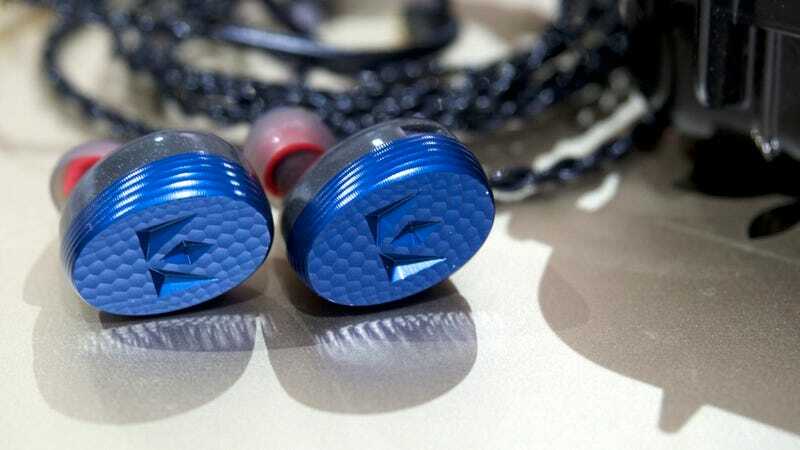 Noble has a whole line of earbuds using the exact same design as the Savants, so fit, across the board, should be nearly identical, from the £275 Tridents to those £1,150 Kaiser 10U. If you want a pair of earbuds you can pop in and forget about, then any pair in the Noble lineup will work. Yet if you want a pair of earbuds that will change the way you listen to music, try another set. The Fenders are great, and I only hear good things about those budget-busting Kaiser 10Us. Some of the best fitting headphones available short of getting goop poured in your ears and going custom. Lacking the detail and bass of the cheaper Fender FXA7s. Very “bright” headphones that could be useful if you listen to a lot of Chopin. Comes with a super cool little Pelican case.